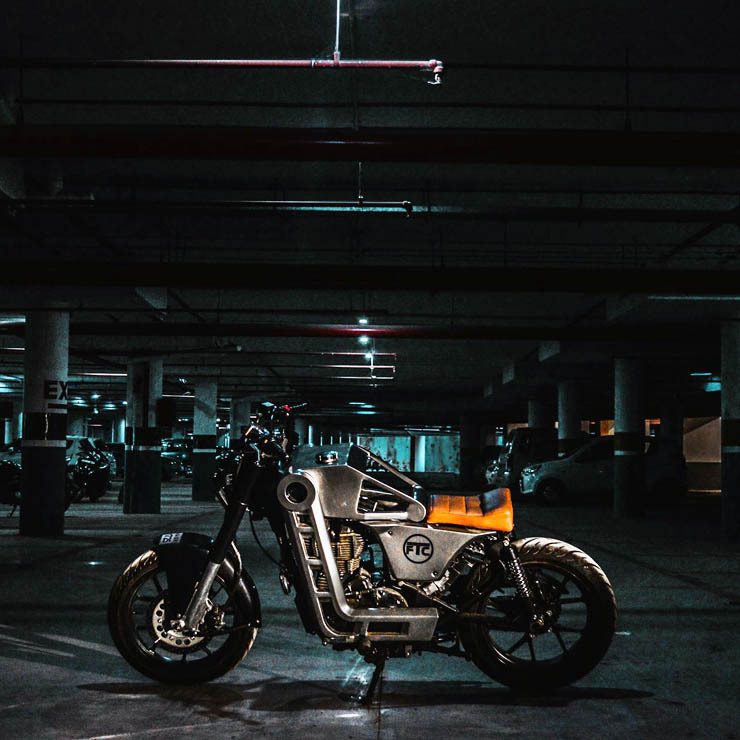 Confederate Motors is a US-based exotic motorcycle manufacturer whose products are well-known for their outlandish design and stratospheric price tags. These motorcycles came into the limelight back when M.S Dhoni, our star cricketer, added a Confederate Hellcat X132 to his garage. The exclusivity of this motorcycle can be gauged by the fact that its other owners include stars like Brad Pitt and Tom Cruise. This motorcycle costs Rs 47 lakh. However, you won’t have to spend such a big amount if you too want to own an alien-looking motorcycle like this. 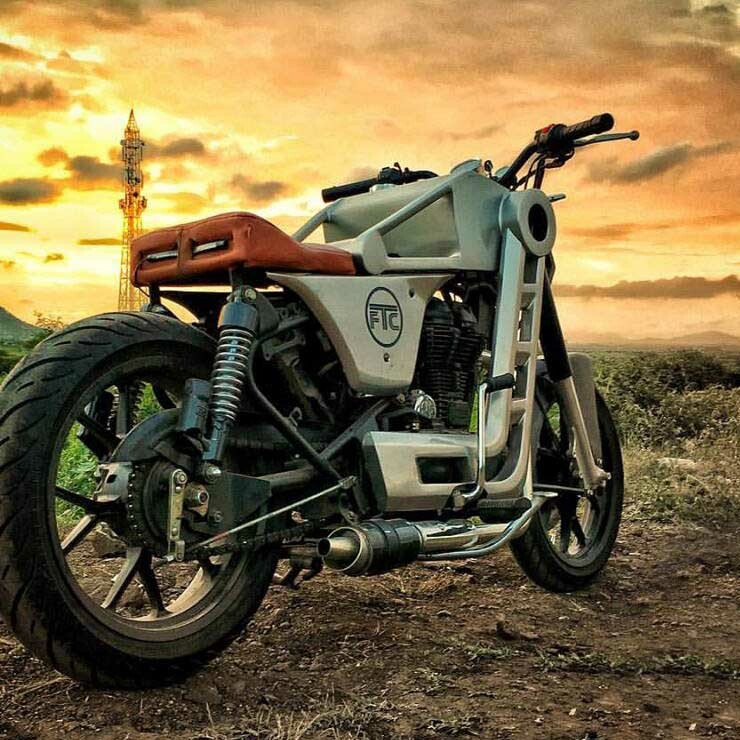 The motorcycle you see below is actually a modified Royal Enfield Classic 500 whose designers seem to have taken inspiration from the Confederate Motorcycles. Done up by Bangalore-based Full Throttle Customs, this modified RE looks almost nothing like anything else on roads. It has been named as the ‘Bazuka’ by its skilled customisers. The motorcycle looks so unconventional that it simply fails to gel with other two-wheelers out there. On the contrary, we feel that it would look completely at home on the sets of a Star Trek movie. The motorcycle doesn’t share even a single panel with the original motorcycle. Up front, you get two vertically stacked projectors. There’s no fairing or anything and the presence of just a twin projector setup gives this motorcycle a very minimalist look up front. The front forks seem to have been carried over from the regular motorcycle. However, unlike the stock Classic 500, this modified motorcycle comes with stylish multi-spoke alloy wheels. Once astride, you’ll be quick to notice the custom twin-pod instrumentation. The biggest highlight, however, is this motorcycle’s fuel tank. The front half of the fuel tank structure carries the actual tank. The remaining part comprises of a hollow frame. This has been done to further enhance the minimalist look of the motorcycle. At a first glance, it looks like the motorcycle doesn’t have a fuel tank at all. The rear fender of the motorcycle has been completely done away with. Also, the original seat has been replaced with a custom one that comes draped in tan leather. All the subtraction of body panels even leads to considerable weight savings. The engine has been carried over unchanged, which means you get the same 499-cc, single-cylinder unit that pumps out a maximum power of 27 bhp along with a peak torque of 41 Nm. The motor comes mated to a five-speed manual transmission. The exhaust system is custom-made. The braking system has been left untouched, which means you get a disc brake up front along with a drum unit at the rear.